Welcome to part one of our Super Mario Odyssey Game In Progress review. This first of two installments covers the entirety of the game’s main storyline, but avoids details about specific surprises and late game levels. Part two will cover the huge amount of game that’s left explore after the credits roll. Super Mario Odyssey begins with one of the most stark, heartbreaking images Nintendo has ever put to code: Mario’s hat being torn to shreds and the scrap holding its little M slowly, sadly floating past the camera. I’d love to be able to say it’s a symbol of how Odyssey treats Mario’s traditions, that it’s the game boldly pronouncing, as Breath Of The Wild did for Zelda earlier this year, the death and rebirth of this foundational holy grail of a series. But as slick, modern, and strange as Odyssey is, that just isn’t the case. It’s not a break from Mario’s more than 35 years of history; it’s a joyous culmination of them. The most obvious drawing point is Super Mario 64. Odyssey has long been heralded as a 15-years-removed successor to that revolutionary work and its follow-up, Super Mario Sunshine, as it returns to that duology’s idea of shuttling Mario between large, disparate, and fully explorable 3-D spaces, rather than the more narrow obstacle-course-style stages we’ve seen him in lately. Instead of taking place in a single split-up location, à la Sunshine, or a bunch of wacky other-worlds that only exist inside paintings, Odyssey’s kingdoms are built to be true living places. 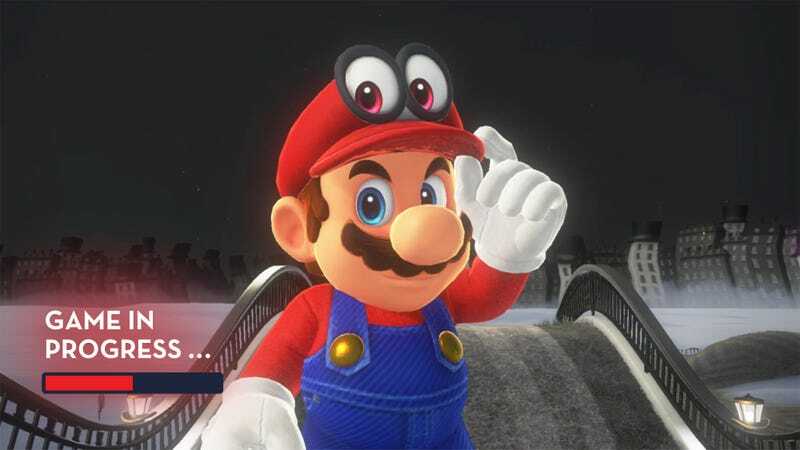 Even though this is a business trip for Mario, it’s more of a holiday than Sunshine ever was, constantly playing up the “travel” theme through little flourishes, like its brochure-looking map screen and how dressing like a local can usually get you into exclusive locations. Most of these kingdoms have a citizenry and culture and purpose that’s reflected in the distinct look of them and upended when Bowser barges through. Bubblaine is a glittering beachside resort that’s renowned for its carbonated sea waters and majestic fountains. The famed New Donk City is a goofy homage to both Donkey Kong and Manhattan, with a bagel store on every block and miserable commuter congestion lurking below its lively streets. And these places you visit change over time, some more drastically than others, as you clear up their calamities and travel to more distant locales, connecting these communities to one another through your adventures. So while the broader world of Odyssey is way larger and more meaningfully connected than what we saw in its predecessors, the levels Nintendo has built for you to explore here don’t necessarily come off as bigger (although many of them assuredly are). Instead, they’re densely packed with secrets and micro-challenges. Every far-flung corner and hidden nook leads to something, whether it be one of the Power Moons Mario is collecting or purple coins, distinct to each kingdom and used to buy costumes and literal souvenirs, or some other surprise. This is where the game starts to split from Mario 64 even further. Where it and Sunshine peppered each stage with a handful of set pieces—climb this mountain, beat up this boss, navigate this maze—Odyssey augments its showy story-based sequences with dozens of lesser Moons. Many of those come down to just wandering around and catching a glimpse of some suspicious pathway, character, or bauble that either leads directly to a moon or a puzzle or, in the best case, an abstract platforming challenge not unlike the “secret stars” in Sunshine. Not all of them are hits (you’ll have more than one sigh-worthy encounter with a Koopa who asks you to recreate a walking trail you’re only allowed to see for a few seconds), but there’s enough specificity and diversity there to keep you from getting bored and, even more impressively, to constantly pay off your curiosity. Much of the game’s variety is made possible by Mario’s “capture” ability, where he throws his hat, which is actually a shape-shifting ghost in this story, and can inhabit the body of certain things it touches, both living and inanimate. Unsurprisingly, Nintendo uses this idea to its fullest, approaching it with the extreme playfulness and thoughtfulness for which it’s known. On the surface, it seems like some massive, world-breaking shift in how Mario operates, but in practice, it’s just the latest incarnation of the arsenal of transformative power-ups the hero has been wielding since Super Mario Bros. 3. (In fact, one of the later levels includes a direct reference to the real-world religious totems that inspired the statue Mario can transform into in that game.) Outside of objects that help with traversal, like springs that flick you up the sides of buildings or power lines that let you travel long distances, Mario’s possessions function like the suits in the Mario Galaxy games. If a capturable enemy is around, chances are there’s a Moon nearby that they’ll help you reach. They completely change how you have to think about interacting with the world around you and give you quick bursts of freshness for a puzzle or two before you move on to something else. And so while structurally the game might have more in common with the sandboxes Mario stopped exploring 15 years ago, the snappy, freewheeling creative energy of his more recent adventures has permeated Odyssey as well. There are more echoes here of those latter Mario games than just their common “always be showing them something new” mentality. You’ll often be taken out of the big open worlds and brought to one-off platform or puzzle rooms that use fixed-camera views and confined pathways similar to Super Mario 3D World. One late-game kingdom recalls the fractured levels of Super Mario Galaxy, with you zapping between floating islands that house their own challenges. There are even traces of Super Mario Maker in the ways Odyssey reaches back to 2-D Mario games and turns them on their heads. The influence of Nintendo’s non-Mario games has found its way into Odyssey as well, most notably Zelda’s environmental puzzles and, in one section, the liquid-based platforming of Splatoon. And yes, Odyssey’s beach level gives Mario Sunshine some love, too, letting you possess a nasty cephalopod critter that uses streams of water to blast itself into the air or wash away lava. It’s been easy to see Super Mario Odyssey as a series-redefining throwback to an idea Nintendo gave up on long ago, but it’s turned out to be so much more than that. It’s a pristine combination of all the directions this company has taken its icon in over the last several decades, cherry-picking the best traits from Mario’s many outings—and out into Nintendo’s wider oeuvre—and rolling them into an adventure that refuses to quit changing. This is a testament to the company’s enduring experimental nature and exacting eye for smart, intuitive game design, but after all these years of largely delivering on that reputation, could we really have expected anything less? As mentioned in the preamble up top, I played all the way through Odyssey’s main story for this first Game In Progress installment. Even while dilly-dallying and finding tons more Moons than the game requires before letting you move on to the next level, it felt surprisingly short-lived at around 15 hours. Luckily, there’s a ton of new stuff that unlocks after you reach the credits, including one pretty mind-blowing surprise. I’ll cover that end-game content in the second and final installment of this series. Odyssey’s musical allusions deserve some extra praise. It doesn’t get better than the bridge of “Jump Up, Super Star!” cribbing the classic Donkey Kong arcade theme, but some deep cuts from as far back as Super Mario Bros. 3 get delightful shout-outs. One thing I didn’t touch on but is worth mentioning, and praising, is how Odyssey eliminates the concept of lives. 1-up Mushrooms are a thing of the past. Instead, whenever you die, Mario is docked a paltry 10 gold coins and sent back to a checkpoint. (And in a surprising twist, you can actually find those 10 coins sitting in the spot where you ate it and regain them.) It’s nothing to worry about, since gold coins are everywhere in this game. But you will need lots of them if you’re hoping to buy all the pretty great outfits Mario can wear. Purchasing Super Mario Odyssey via Amazon helps support The A.V. Club.